On Thursday 16th September, we are likely to have the largest strike by public service workers since our democratic breakthrough in 1994. The SACP is not in the habit of involving itself directly in the details of any collective bargaining issue or dispute, especially when it relates to remuneration. We believe such details should be left to the parties in dispute, and we have confidence in our trade union movement to handle such matters. In this case, we fully agree with the expressed sentiment of both parties that they would have liked to avoid this strike. We are still hopeful that, even at this late hour, the parties will find a solution and avert a crippling strike in the public service. We urge the parties to the dispute to continue seeking a solution to this impasse. However, we do have a deeper concern around some of the debates and issues raised in the lead up to this strike. Whenever there is a dispute in the public service, there is a disturbing tendency to headline disruptions to services to learners, pensioners and other recipients, while the legitimate concerns of public service workers are entirely marginalised. This is tantamount to political and moral blackmail of public service workers. It is an approach that pits the rights of workers against those of the rest of the population, as if public service workers and their families were not also citizens, learners and pensioners. This approach relegates to the bottom the rights of workers to advance their collective interests, including the fundamental right to strike. There is no such hierarchy of rights in our constitution. The SACP agrees that the various constitutional rights need to be balanced to ensure that we are able to foster a people-centred and people-driven democracy, with sustainable growth and development. However, there is an incessant campaign of denigration of the public sector by the privileged, those who, precisely, do not depend on public schools for their childrens’ education, on public hospitals for their own health-care, or on the state for their pensions. The wealthy in our society want to roll-back, down-size and generally gut the public sector, while at the same time constantly berating it for “inefficient” services to the poor. Over the last period, government has defended, with growing conviction, the public sector and the workers in it as a key strategic resource, absolutely essential for addressing our manifold challenges of poverty, inequality and underdevelopment. However, over the past decade this has not always been as strongly asserted as it is now. The present, threatened strike needs also to be understood against a background in which tens of thousands of public service workers have had to cope with the daily pressures of over-burdened and under-resourced public institutions on the one hand, while being told that they are “supernumeraries”, “lazy”, “irresponsible” and basically only fit for the scrap-heap. We are not saying that all public service workers are equally energetic or committed, but the constant denigration of the public sector and the workers in it needs to be understood for what it is — the class agenda of a tiny minority in our society. We reject the attempt to project all worker struggles as inherently selfish, and the attempt to pit workers’ interests against the interests of the rest of the population. We shall defend workers’ rights in the same way as we defend the right of learners to learn. However, these are overwhelmingly the children of the very same workers. It is the wages of workers that ensure that hundreds of thousands of learners are fed, and the costs of education, including transport and expensive school uniforms are met. It is with workers’ wages that desperate needs of millions of unemployed and sickly are addressed as best as possible. In a country with such high levels of poverty and with 40 percent unemployment, typically the salary of a nurse, a teacher, or a municipal worker is not just an individual worker’s resource, but a social wage for an extended family network. The SACP calls for a holistic approach in dealing with the current dispute. Much as the SACP would not like to see the disruption of public services, we fully support the right of workers to strike. The SACP also notes the persisting structural problems in public service wage negotiations. These negotiations take place after the finalisation of the budget. This places both government and the unions in a perpetually difficult situation. With the budget passed by parliament, government has little space to manoeuvre, and the unions’ collective bargaining rights are severely curtailed. We are of the view that in addressing this year’s impasse, we need to quickly move to address this matter as well, perhaps by aligning the negotiations process more actively with government’s medium-term expenditure framework cycle. The SACP remains hopeful that even at this late hour a solution will be found. However, the right of workers to strike must also be fully respected. Labour Day 2012: A Moment of Truth For Labour? 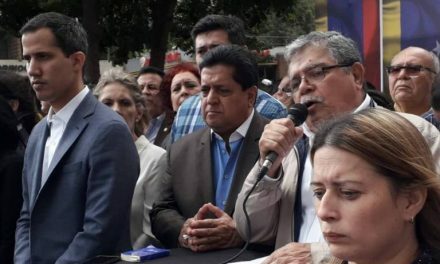 What Is the AFL-CIO’s Solidarity Center Doing in Venezuela?